Microsoft Research has demonstrated software that can not only translate your words into other language, it can do it in your voice, preserving the accent, timbre and intonation. In a demo of the prototype software... Rick Rashid, Microsoft’s chief research officer, says a long sentence in English, and then has it translated into Spanish, Italian, and Mandarin. You can definitely hear an edge of digitized “Microsoft Sam,” but overall it’s remarkable how the three translations still sound just like Rashid. In order for the translation system to do its work it needs about an hour of training, which allows it to create a model of your voice. This model is then mushed into Microsoft’s standard text-to-speech model for the target translation language. Star Trek fans are chuckling, no doubt, recalling the famous lizard man translation from the classic Trek episode Arena (start at about 45 seconds). Note the perfect translation of Lizardese into English, while maintaining the Lizard Man's voice characteristics. 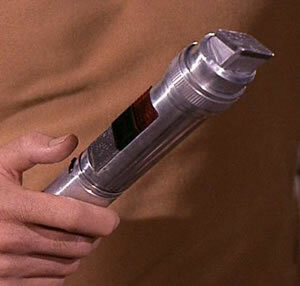 As you can see, he is holding the Star Trek Universal Translator. If this actually works and catches on, you can say goodbye to Pimsleur, Berlitz, Rosetta Stone and all of those other programs that help you learn a new language. Via ExtremeTech; listen to a demo here (starts about 12 minutes in).